Bambarella to Thangappuwa is a popular trail amoung the knuckles trekkers. There are several attractions can be seen in this trail. 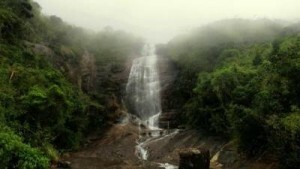 Kota Ganga Fall is a cascade of six+ waterfalls flows from Thangappuwa to Kota Ganga village in Knuckles area. I have trekked from Corbet’s gap to Thangappuwa and enjoyed the beauty of full spectrum of Kota Ganga Falls. I was searching for a place to do some trekking as some of my best buddies with whom I have enjoyed some memorable hikes, were available for some fun…. After going through some of the places I thought of paying a visit to Knuckles. This time my place of choice was Thangappuwa as I was not able to hike from Thangappuwa for which I was not happy at all. So days were fixed and weather forecast though not 100% perfect was fine. I haven’t been doing any hiking recently and I was starting to see leeches in my dreams too and finally it seemed like my dreams were converting into a reality. Krishani called me and asked for some information of a guide in Thangappuwa to do the Kota ganga trail. I asked her whether I could join them because this hike was in my long list and my request was accepted gladly by Krishani.